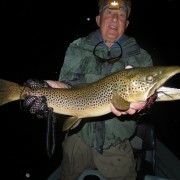 Manistee River was around 6000 CFS. Flood stage on the Parana is somewhere in the millions of CFS, this River is beyond big!! 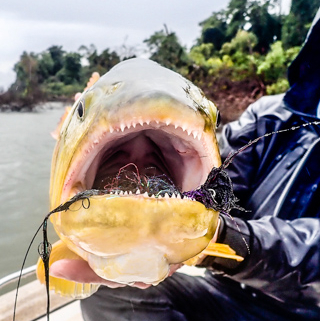 So the structure that these Dorado are going to use to ambush prey is going to have to match this trend. On the first afternoon of fishing we pull up next to a rock structure in the middle of the river and you see this big seam kicking off of the rocks and it looks fishy! Lucas, my guide for the afternoon, wants us to throw the fly next to the rocks and slowly strip the weighted deceiver pattern through the fast water along the rocks. After a few casts and working down this rock structure I have my first encounter with a Golden Dorado. Let’s just say I set the hook hard, but not correctly. If you have ever fished with me you know I’m not afraid to do most things aggressively. Well, this Dorado made me pay as I was setting the hook as if I was smallmouth fishing, but, I was confident I could generate enough power using my hips to turn into the hook set. The 12-14 pound Dorado crumbled my rod, blowing up my brand new 9′ 9wt Meridan. 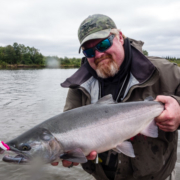 If you don’t strip set, keeping the rod straight and pulling hard on the line, these fish just have too much power and your equipment will not handle it. The tone had been set and I had a new respect as I was immediately in love and the Dorado had me at Hello. Let the record state, I did land that Dorado. I love 40 pound fluorocarbon. With my rod in pieces I just simply used my hands by hand-lining the dorado to the boat. Both my guide Lucas and my customer Kean were in awe of what just happened. Me personally, I was laughing hysterically as I can’t believe my 1st rod of the trip lasted a total of 20 Min. To explain what Golden Dorado resemble, well there isn’t really one comparative species I can think of to describe their makeup. They remind me of at least three of my favorite Michigan gamefish. 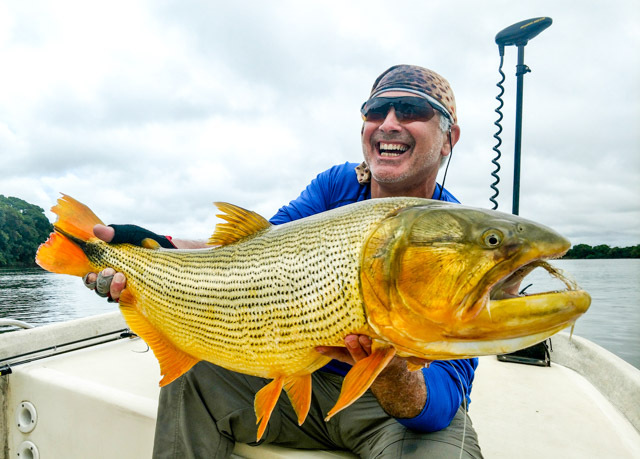 First of all what stood out about Golden Dorado is their kill speed, or burst speed. 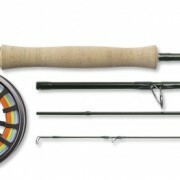 Ed McCoy will back me up on this as we both agreed that they are faster than a Fall Steelhead. The initial take is more like an explosion on the fly as they are so fast, it’s literally startling!! Like Smallmouth Bass, after you hook a Dorado the battle begins! Jumps, runs, and an endless fight all the way to the net. 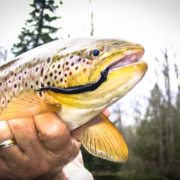 These fish don’t really make a long run, but, they have just tremendous straight pulling power all the while testing your equipment to it’s breaking point. A battle of tug of war is how I can best describe it. 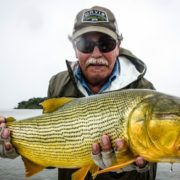 Finally, the attitude of a Golden Dorado is a mix of a Muskie and a very wise old Brown Trout, moody isn’t exactly the word I would use to describe it. You want to insert improper language here, because that is what their temperament can be like. But I happen to be drawn to fish with this type of attitude. I love that challenge as I often remind myself, if it was easy everybody would do it. 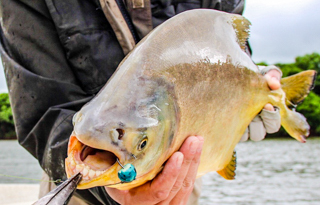 Golden Dorado are known as the “River Wolf” , this name depicts them perfectly. Dorado do seem to have a pack like mentality. Hunting the sheep of the river, or other wise known as the Sabalo. 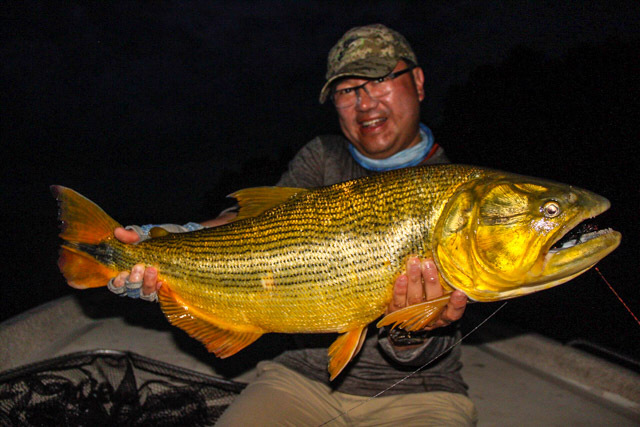 Sabalo are the preferred meal of the Golden Dorado. The Parana River system is full of them. We would fish runs that would seem to have a couple million Sabalo in them. Now you probably think I’m exaggerating, but, as your stripping your fly through these runs your fly is bouncing off the backs, fins, tails, and what ever other body part is in the way. 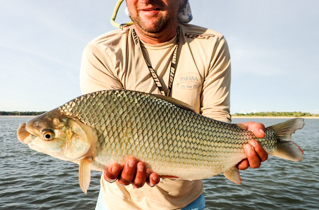 With the amount of baitfish in the Parana River it was ever a wonder that we hooked any Dorado at all as food was clearly not a limiting factor to their survival. time). Anyway while Ed was fishing the bead, he hooked a Pirapita and while bringing in his catch three different double digit sized Dorado emerged and tried to eat the Pirapita. This feeding frenzy went on for over a minute and needless to say that Pirapita had to be glad Ed was able to bring him into the boat. It was a sight to behold and this showed us that Dorado can and will hunt anywhere and are fearless predators with an unparalleled killing instinct. Welcome to the Jungle!! these foam creatures would eat our own patterns for lunch. Throwing a foam Chernobyl Ant on 6 and 7 weight rods was a welcomed relief and lots of fun, especially during the middle of the day. We had lots of explosive action and most importantly you would try and get these hopper patterns way up under the trees and overhanging limbs. Dorado are less active in the middle of the day so Pirapita and small Dorado (1-3 pounds) were the main focus. The lodge at Parana on the Fly was A+ on every account. Rooms had plenty of room for two anglers, comfortable beds, nice bathrooms, Flat screen TV (that I never turned on) and AC for a comfortable nights sleep. The staff at the Lodge did our laundry so it was easy to pack for this trip. You didn’t need to bring much to begin with. The food was perfect, we always had plenty to eat at breakfast, lunch, and dinner. If you haven’t traveled to Argentina yet and your a red wine fan, the Malbec they serve is worth the price of admission. The guides on the trip spoke enough English to understand any questions that we might have and did an amazing job running the boats in such a fast river. The 17 foot boats they run are made out of fiberglass. 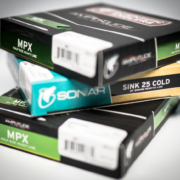 They were super quiet, controlled nicely with the 55 pound thrust of the Minn Kota trolling motors making it easy to retrieve flies that were thrown errantly into a few trees. I can’t thank enough Lucas, Lucas, Carlos, and Marcelo for everything that you did. You guys are true professionals. 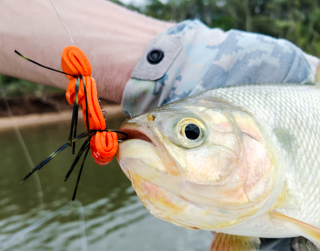 If you are a streamer fisherman then the Parana on the Fly is a dream destination. The amount of “fishy” looking Golden Dorado water is endless. 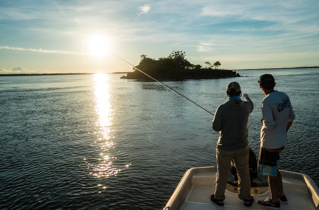 The fact that you can throw big streamers on Intermediate lines and big fish with pile drive them and test your physical ability makes this an absolute dream trip. 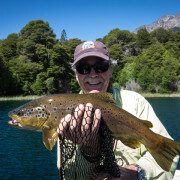 Along with great guides, good food, and a comfortable Lodge this destination is a must do on everyone’s bucket list. 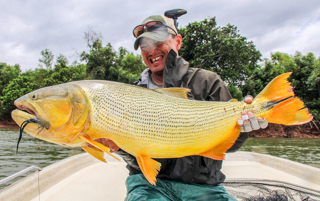 I can’t wait to go back as the Golden Dorado exceeded all of my expectations. Man what an experience!! 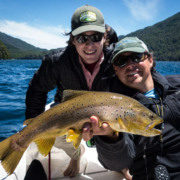 It’s been two weeks since my return from Argentina fishing for Golden Dorado and my mind is still racing from an absolutely amazing destination travel experience. This one will be hard to beat and I just wanted to thank everyone who joined us and Jon Ray for allowing me to share that time with you all on the water, words can’t describe it. Parana on the Fly rocked it, I will definitely be back!! Well stated Jon and Ed. Your description of the experience is perfect. I was challenged beyond my expectations, but feel satisfied with my abilities and resulting success. I must thank Jon for all the years of instruction on reading the water – made the odds for success so much better and to a man, all of us achieved our goals. It was a place that seems magical now that I have had time to reflect. Fish, eat, sleep and repeat was the prescription here and I think we all followed doctors orders. I got an additional pleasure of practicing my Spanish, and even got to give a toast to our guides en espanol at the end- what a hoot. Yerba mate shared with the guides a must, if you go. Thanks, boys for a marvelous week. Jerome it’s been a pleasure fishing with you and sharing so many experiences. I look forward to what the future holds. Thank you for everything you did on the trip, your Spanish toast to the guides will be something I will never forget. Thank you. Jerome it was a pleasure spending the week with you and a day on the water as well. It was a great trip and I too will forever remember the Guide Toast, it was like the perfect ending to an amazing week!